Each student will perform a monologue in class with direction, feedback and dissection from the instructor. ​*students provide their own 1-2 minute monologue piece. + Who are you speaking to? + Why are they a good choice for relationship for this specific piece? + Are you speaking in your voice, or are you putting on your "actor" voice? ​+ Vocal variety - are you allowing yourself to breathe, pause and discover moment-by-moment​? + Are you being authentic? A note from Lydia: With a 95% callback rate for monologue auditions and a role with a major television network under my belt, I love to help actors craft their monologues to best showcase their strengths in a vulnerable and intimate way. "Lydia is fantastic! She is a patient and knowledgeable instructor who connects with actors of all levels. Highly recommend you take her course. Excited to take her classes again after I graduate from PSU." Lydia has been performing since the age of five. 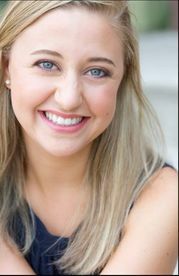 She completed a rigorous two year Meisner based training program in San Diego before transferring to complete her Bachelor’s of Theatre at Columbia College in Chicago. After graduation, she founded Perspective Charter School’s first ever drama club program and formed an all-female solo performance troupe. Since returning to Portland, she has become an actor and board member of Jester Educational Theatre; a creative nonprofit that brings live musical performances to a wide range of Portland Public schools. Lydia was most recently seen on stage in ‘Fly Guy: a world premiere’. She is represented by Q6 Talent Agency and you can watch her in the "Wonderland Murders" on Amazon Video. Lydia has been teaching at Vision8Studio for over one year. "Lydia is great about helping you choose monologues and giving you advice about them afterwards. Her coaching me has led me to have great audition monologues and successful auditions. She is really thoughtful about what is best for you."